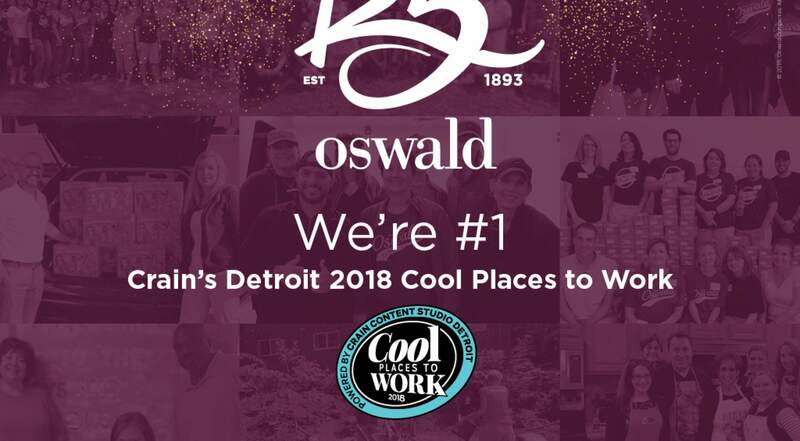 BLOOMFIELD HILLS, Mich. — Aug. 20, 2018 — As a first-year nominee, Oswald Companies’ Bloomfield Hills office was named the number one Cool Place to Work in Michigan by Crain’s Detroit Business. Along with 99 other workplaces who made the list of cool workplaces, Oswald was measured and ranked in terms of employee satisfaction. Although each company provided a detailed account of their benefits and policies, it was the confidential employee responses to an 80-question survey that accounted for 75% of the final ranking. Oswald Companies, an insurance brokerage and risk management firm, is employee-owned through its Employee Stock Ownership Plan (ESOP). This effectively gives everyone an interest in the company. “When it’s literally your company, you feel empowered,” said Catherine Kosin, Senior Vice President and Michigan Market Leader. “It allows us to act in the moment, doing the right thing for our clients and fellow employee-owners,” Kosin added. Among the programs cited, the company gives employees a paid day off to volunteer at the charitable organization of their choice, on top of quarterly office-wide days of caring and monthly visits serving the homeless community at the Pope Francis Center. Appreciation runs deep with a recognition program in place that allows every employee to reward positive behavior traits and exemplary efforts in a variety of areas. Recognition translates into badges and points that can be accumulated and then redeemed for merchandise of the employee’s choice. With a ping-pong table and treadmill available for daily stress relief, the office holds an annual chili cook-off, plays their own version of Family Feud, and hosts a women’s networking event to both support women in their career development and raise money for a charitable cause. Cleveland-based for 125 years, Oswald Companies has five Ohio branches in addition to their Bloomfield Hills location. In Michigan since 2006, the office provides commercial Property and Casualty Insurance, Private Client Management, Life insurance, and Employee Group Benefits. Connect with our Detroit office by clicking here.